Woke, walked Mix, breakfasted and joined Neil and Tom in the Hen House where we all spent the morning plaster boarding. No, we didn’t finish the room (that will be tomorrow) but we had a grand time. The room, Tom has decided, will be called the Studio because of the excellent light. It was to have been a library but with all the bookcases in the summerhouse and in the bothy, another would be totally over the top. David arrived and installed a power point for our electric saw and then he departed suffering greatly from a cold. Just about everyone has succumbed now. Neil, Tom and I, along with Mum and Rachel, all went to Gavinton Church for the soup and sweet lunch. It was excellent and great fun and afterwards we all went our separate ways. I returned to the summerhouse where Mix and I prepared a service for Sunday at Gavinton. 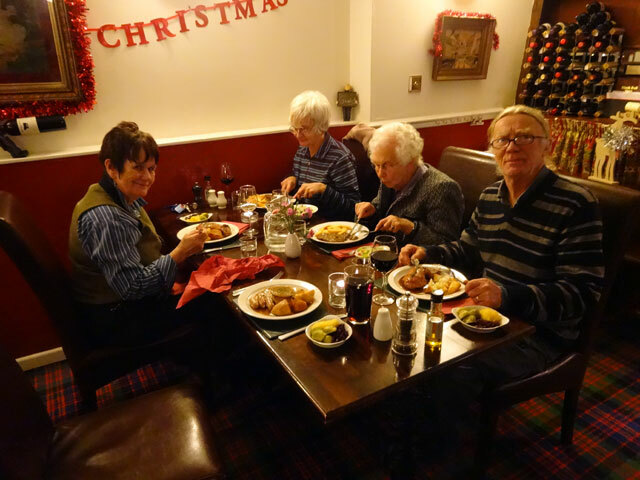 Afterwards I had a shower and then went as Mum’s guest with Olive, Digger and Rachel to the Black Bull in Duns for my first Christmas meal of the season: Scotch Broth, Turkey and Christmas pudding. It was an excellent meal and beautifully served. Back home I walked Mix and retired to bed – while my cold is retreating it is certainly not yet vanquished.